Globalization has been a driving force for the industrial world for decades now. Multinational enterprises no longer limit themselves to a single geographical area for the production needs and often spread their plants across continents. While such diversity does lead to lower costs when serving a specific area, it does bring its own pitfalls, most serious of which is extending technical support. Things often go wrong, and it isn’t always feasible to have an engineering team on-site to diagnose, troubleshoot, and fix the problem. Even if there is an engineering team, they won’t always have the skills required to fix problems belonging to a wide spectrum. As industrial automation becomes more mature and gets overtaken by concepts such as Industrial IoT and high capacity connectivity medium, it is becoming possible for machine builders to perform remote troubleshooting on their equipment. Providing interconnections between the plant’s machinery and the supplier or vendor can now be done quickly. With a remote communication channel, manufacturers can have peace of mind without worrying about the huge costs related to Support Service Level Agreements, maintaining on-site teams, traveling, and so on. In addition, the ability to monitor a machine with respect to time would also give the machine builder additional insight into the operation. This will allow data to be accumulated over time. Predictive analysis can then be implemented to perform maintenance activities before a breakdown occurs. Remote monitoring has traditionally been carried out through telephone or fax services before the widespread use of the internet. On-site teams would make contact with the builder or vendor and ask for support. Not only was this process inefficient, it was prone to errors since the vendor seldom had a clear picture of what was going on. The advent of the internet gave machine builders a clearer insight into the machines’ operations and allowed for the collection of data. With the passage of time, high speed and reliable internet turned into a reality, along with greater computing power. This instilled newfound flexibility and sophistication into the manufacturing plant, giving the vendor greater access. But, at the same time, this also gave way to a host of security risks, that could lead to loss of equipment and personnel if control ever got into the hands of malicious individuals. To counter malicious intentions, IT professional turn to Virtual Private Servers and firewalls, thus creating an internal networking route for all traffic. This is one way to monitor and control assets remotely. Another way, which is gaining a lot of traction, is through a completely independent cellular-based wireless network. Because this eliminates the connection between the industrial modems and the factory’s intranet, there is much less chance for any hacker to get into the system. 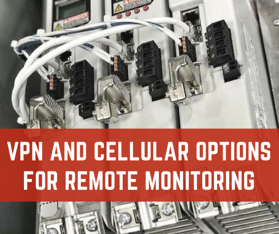 To get the best of both worlds, a VPN implementation over a cellular connection can be used. A dedicated computer may be required at the factory end for this, which will be used for data collection, remote communications, and status monitoring. One may even install applications such as PLC programming tools and HMIs on the PC to increase the remote visibility of the system. Another option that Systems Integrators can utilize in this regard is the use of Hardware VPN modules. The device sits between the remote computer and the cellular modem, encrypting all communication packets that travel across the pathway. No matter which option you choose, you will require professional expertise to get the system up and running. In order to do so, it is recommended to either choose a hardware supplier that assists with the installation or hire a Systems Integrator company. If the implementation is sophisticated and extensive, training your in-house team would also help. This would also bring down maintenance costs and save you from involving an external team into the plant’s security matters. Interesting in learning more about VPNs and cellular networks? Contact an expert today!